he posts like everyone is out to get his man-crush, if you make a comment talking about how good giroud played, even if its on a montpellier thread, he assumes its a go at you know who. in a week where other top strikers in europe might not have scored, or had a good game, even if benzema did not play that day, he'll spring up out of nowhere acting like benzema scored a hattrick. damn it all the attention benz has gotten on this forum, he's an alright player and all, but its not like he's van basten. Completely right tito... and I can't believe we're STILL under the impression that Isco and James can transform into high level CMs. I mean come on. You figure that several years of highly inconsistent results would make us think it over again. Not to mention that they're both the same. And who are they backing up anyhow? Modric? Kroos? Most definitely not Casemiro. I'm looking at the squad and I see limited options in terms of allowing tactical variability for Zidane. I also see big problems if we get injured in certain areas. You're always going to drop off if a starter gets injured... but I see us having to entirely change how we play if some of the guys go down. 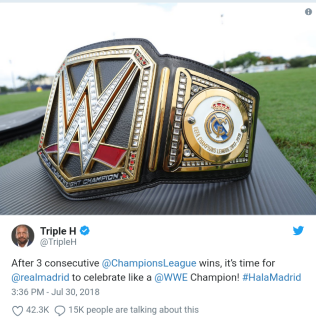 A little common sense by Madrid's management would be nice. I'm not disagreeing with you Sports, only pointing out the rationale. 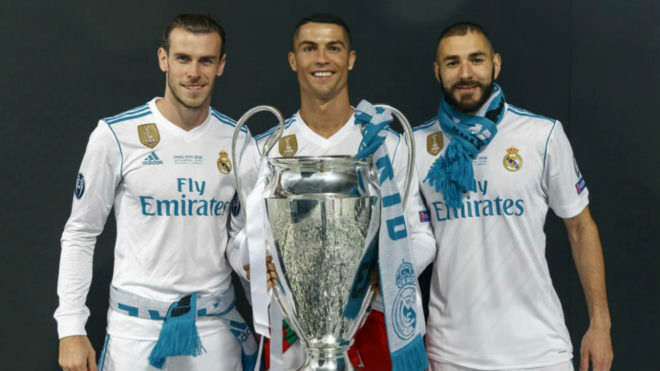 The front three are set and world class. For backups, we have Morata (all 3 positions), Lucas, Asensio and James. THat's better than last year. The strategy here is James regaining form and push the front three for minutes. The midfield is Kroos, Casemiro and Modric. with Isco, Kovacic and likely Marcos Llorente as backups. Yes it has the problem you and Nick have discussed, but if Isco steps up his game, in theory, he can provide the verticality required. ALso don't be surprised if Zidane does play an AM (Isco or James or maybe even both (or even Asensio) with Modric / Kroos against some opponents. Defense is virtually unchanged from last season except they do have Coentrao supposedly coming back in November and in interim, that is where Nacho will get his minutes. That is the reason he is still with club. So bottom line is they have filled the three needed spots with Morata, Llorente and Coentrao / Nacho. As to the desired midfielder, they are counting on return to form of both James and Isco. That's the logic. You can called it failed logic if you like, but there is a basis for it. WHat I personnaly find wrong with it, is it reasonable to expect both Isco and James to somehow contribute? And what happens for next year, if they don't. I do agree with you re LB and I would have liked a more established DM. I also would have left Asensio out on loan for other year, waiting to see how the other AMs (James, Isco) adapt, however the FIfa rule prohibs that. Jese is more than replaced by Morata, plus you have to hope that James regains form and that also will limit minutes for any of the forward backups. Jese can someday become a big player, but the truth is he hasn't grown in last three years and he never did recover the pre injury form. The club wanted him to go out on loan to get the starter minutes he needed to develop. It was his choice to be sold to another big club where he will be again a reserve and a reserve to not his best position! Yes, it is pre-season and his first game back, but James is so bad. He doesn't fit into the team, no matter the system. With the likes of Asensio and Odegaard, who looked great yesterday, in the team with bright futures, there may be no place for him. @Cyborg wrote: Yes, it is pre-season and his first game back, but James is so bad. Ødegaard is 17, there's no way he'll stay with the 1st team. I hope for his sake that he gets loaned out to a decent club in one of the top leagues, for at least 2 seasons. Bayer Leverkusen and Hamburg are interested in signing Martin Odegaard for a loan. But he wants to go to Liverpool on a permanent transfer... he's waiting on that one. I don't know about ye, but odegaard is a mess the moment we signed him. Dude should have taken the hint and grab his loan a long time ago. @Turok_TTZ wrote: I don't know about ye, but odegaard is a mess the moment we signed him. Also, he is 16. 16. He, or maybe I should say his father, should allow him to focus on developing his skills in training and playing in the lower leagues with Castilla (or elsewhere in that same skill level). Trying to rush him to play high level football at this age can be very detrimental if he is not ready. But he is not my child so whatever I guess. Also, not sure what Nick's agenda is with calling Lucas average but I would say this: Lucas skill level is limited to what he can do. He isn't Joaquin, Vicente or a De Pedro but he is incredibly useful and does what he needs to do very well. I totally wish James was as useful as Lucas which says a lot. Come on guys. Let's give some credit to odeguard (probably didn't spell that right). From what I saw in the preseason he's improved bounds from when I saw him last year. And he's still young. He should definitely be loaned out but he is doing very good with his development. Loan to where exactly? What club playing in the top leagues would trust a 16 year old that isn't their own first team football? Like I said, I'm not the boy's father but he would be way more useful with in a more comfortable environment (like Castilla) than him having to fight up with harden footballers for playing time. The suggestion of him going back to Norway actually would make sense. A bit tough with Payet, Feghouli, Eder Valencia and Andre Ayew though. That's not the place I would have chosen. He's a sub for sure. Kids need to play. I was hoping for Monaco who plays kids a lot. @sportsczy wrote: A bit tough with Payet, Feghouli, Eder Valencia and Andre Ayew though. That's not the place I would have chosen. He's a sub for sure. Yeah I agree. Rather see him in an Asensio situation where you make the loan free with a number of appearances. Also to a small club. Don't understand why you'd consider that big of a club. Injuries happen and West Ham plays in Europe this year so they need a bigger squad. Maybe circumstances will work in his favor... big risk though. They may not. Is it a full year loan or does he have a player option at the next mercato? If he's riding the bench, it would be nice if he had the option to leave. It's a season long loan in case we need players next season during the transfer ban. If we need players we can still register players loaned out before the ban is in effect. They signed Ayew too Fenec. Oh didn't even know. In that case then he's gonna be good for rotation for the Europa league. Not too bad I think.